Fishing Report! 10-16-08 Jeff Sundin - That's A Wrap! Almost. Well folks, This will be my last fishing report for a little while. My season is coming to an end after this weekend and with a little luck, I'll be getting in on some duck hunting next week and then we'll see what the weather has to offer. Even though my days are numbered, yours don't have to be. Fishing has been steady this past week. Water temperatures are holding their own at 50°F or warmer and all indications are that you'll still have at least a couple weeks of good opportunities if you want to take advantage of them. Walleye fishing has been the main focus for me since last week and we've been lucky that warmer water temperatures have helped keep the action steady. In a weeks time, we've had good action on the Rainy River, Leech lake, Lake Winnie, Pokegama, Cutfoot Sioux and a few others. I've tried to cover a lot of ground because this time of year the fish are generally cooperative and I like to have one last chance to say "goodbye" to some of my favorite spots. There have been a couple of days that we've fished up to three lakes and caught at least some fish on all of them! We're still finding some decent numbers of Walleye in the shallows and the weedline jig and minnow bite could be a good way to go for the next week or so. One caveat has been that we've had to locate good, green weeds otherwise the fish haven't been there. While the weeds we do find are still generally green, windy weather has "blown away" lots of the shallower weeds on the wind-swept sides of larger lakes. Area's where the cover is too thin, have been a waste of time, so we've started looking in areas where deeper weeds have held on a bit longer than the ones on shallow, sandy flats. On many of the smaller lakes there are still good weed beds because they've been less exposed to the really windy conditions. If you have some favorite lakes that are smaller, I'd suggest spending some time there for the rest of the season. A real favorite for some of my customers and me has been to wait until late afternoon and evening and then fish the deeper rock/weed points with large minnows on live bait rigs. This has been primarily catch and release fishing for larger fish and if you've wanted a chance at catching a trophy fish, this is the time to try this pattern out. The real secret is picking a lake that's known for big fish. The method of fishing is really simple; we use a five to six foot leader tied on 18 pound fluorocarbon line with a #1 hook, a 1/2 to 3/4 ounce egg sinker and large Creek Chubs or Redtails if you can get them. Fishing in depths of 22 to 30 feet is the most common, but you can experiment with this depending on the lake. We generally feed line as you would with a leech or night crawler, but at times the large Walleye are aggressive and you can catch them by simply pausing for several seconds as the fish inhales the large minnow. Set the hook softly and keep the pressure even, but gentle as you bring the fish in. This helps reduce line breakage and damage to the fish if they happen to be hooked deeply. Unless you catch a wall hanger, it's a good idea to let these fish go and in this cold water, we've had good success releasing them. 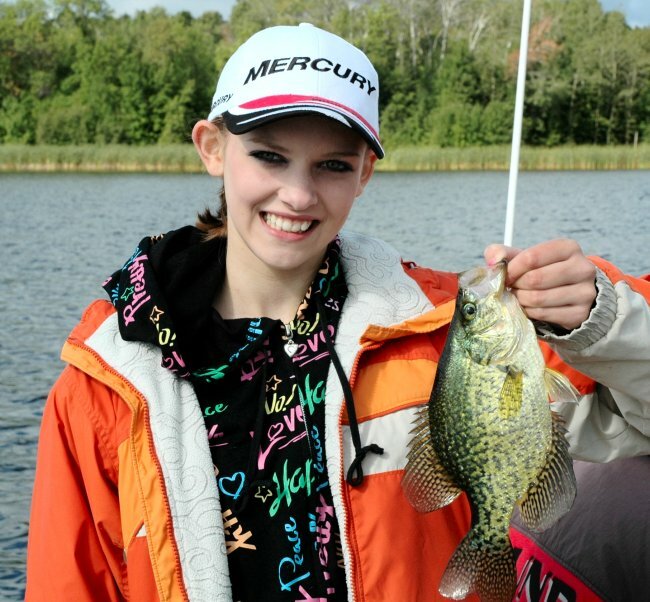 Crappies Have been available, but continue to move deeper and out into open water. I've backed off from the Crappies a bit this week, but the few times we've looked for them, they have continued to cooperate. For the most part, I've stopped chasing them on lakes where they've gone really deep because it's just too hard to release any fish. I've had better luck on lakes where the water depths max out in the 20 to 25 foot range. Even if the fish go all the way out to 25 feet, you can still release the ones you don't want to keep. The jig and minnow combos are still okay, but this week we had some better success using a small 1/8 or 1/4 ounce "Swedish pimple" type jigging spoon. Colors like a Glow/Blue, Glow/Pink or similar combinations have been good. We are not tipping these with any live bait. Just get them a foot or two above the main schools of suspended fish and use a gently jigging action with plenty of pause time between jigging. The pause or even a slow lift upward seems to be the best trigger for getting the fish to strike. Perch fishing for me this week has been a matter of catching fish by accident as we stumble into them while we're fishing for Walleye. We did spend a few hours on Lake Winnie looking for perch last week and the best action we found was located in 4 feet of water in heavy weeds in an area protected from the heavy wind. We fished jig and minnows vertically by kind of poking around in the heavy weeds until we located fish. Once we found them, we stayed close to the area until the bite began to fizzle out and then moved along slowly again until we located the next small group of fish. 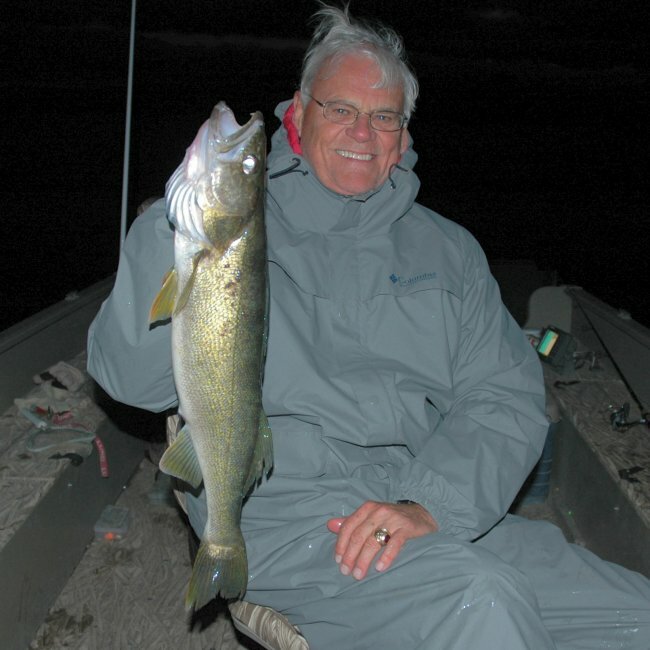 Walleye fishing in the fall offers folks an above average chance at a lunker. We've been concentrating on the on lakes that are known for having big fish and spending time during the prime evening bite. 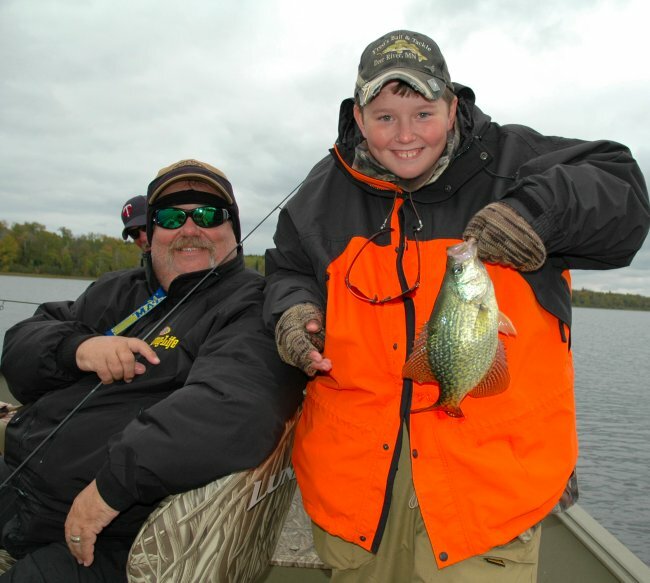 Crappies on some of the deeper lakes have moved into water depths of 35 feet or more, but we can find them on shallower lakes too and fishing shallower means more releasable fish. Traffic on area lakes was at it's peak over the past weekend and even though the fish were fairly cooperative, it was obvious that a change is on the horizon. Surface temperatures are now hovering around that magic 55°F mark and the fall turnover, along with the changes it brings has been on my mind every day. We've enjoyed some really nice weather this fall so it's a little hard to see the season wind down, but winding down it is and within the next couple of weeks, most anglers will be counting the days until the ice fishing season. I'll be on the water for another ten days and so except for an occasional minor update, this will be my last major fishing report until the ice fishing season draws near. Walleye action is far from over for the season, but there has been a slowdown in recent days as the water temperatures continue to cool. The later fall patterns are starting to emerge and on some of the better Walleye producing lakes, fish are showing a preference for early morning and late evening. Typically, we've had good action first thing in the morning and then periods of slow fishing during mid day. If we wait until sundown, there's another spurt of action. Fishing with jig and minnow combinations has been standard, but as late as last Saturday, we've still caught fish on night crawlers and there were some reliable reports from some folks who were still live bait rigging with leeches. A good rule of thumb would be to stick with jig and minnow fishing while you have a good breeze for drifting. if the wind calms down and the action drops off, try switching to the night crawlers to pick up those last few bonus fish. 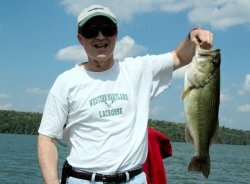 For anyone with aspirations of catching larger fish, now is the time to head out to lakes or rivers with a reputation for larger fish. We've already made one trip up to the Rainy River and although I think we were a little early, the fish are beginning to move and we did have some good action. This week I'll be planning some late afternoon live bait rigging with Red Tails and larger Creek Chubs for both large Walleye and Pike. 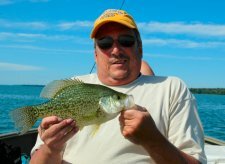 Crappies continue to provide good action, but some of the more popular lakes (and spots) have been getting heavy pressure. During the past week, they've really moved a lot deeper. 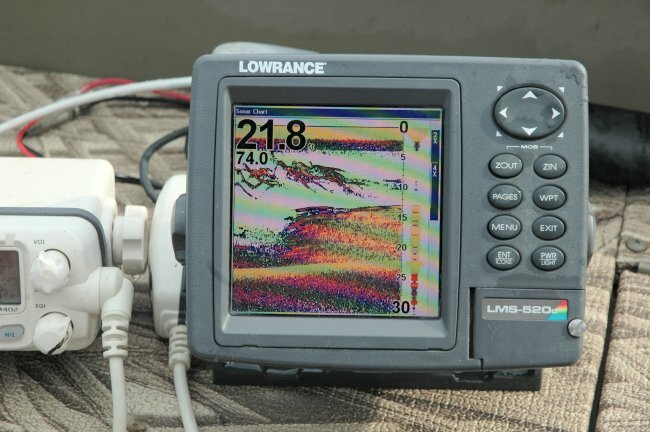 How deep depends on the lake you fish, but the rule of thumb would be to locate the deepest holes in your lake and begin searching along the edges of these deep holes. On shallower lakes, this could mean searching for fish in 15 to 20 feet, while deeper lakes may have Crappie located down to as deep as 40 feet. We had consistent action this week in water depths of 35 to 38 feet, so don't be afraid to check those deep holes. For me, the jig and minnow combinations still work fine, but we fished near some folks who were doing really well using jigging spoons. Small jigging baits like a Swedish Pimple, Slender Spoon or jigging Rapalas would be good choices. Perch fishing has continued to be hit or miss for me, but there are fish out there and folks who spend more time looking for them are doing very well. The best Perch action is in shallow water of 5 to 7 feet. 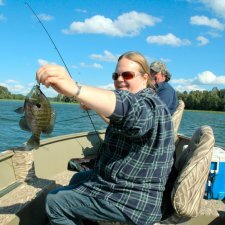 Almost all of the better Perch lakes in the area have huge schools of small fish this year, but if you're willing to spend some time searching and sorting through the small ones, it is possible to get average fish from 9 to 10 inches with some 11 inchers mixed in. Sandy areas with mixed weeds, gravel and light rock are going to be best. On the large lakes like Winnie and Leech, small, young of the year Perch minnows are roaming the shallows in 3 to 5 feet of water and lots of these small "Perch Minnows" will attract schools of hungry Perch. The fall shiner runs have still not started either, so areas of heavy weeds adjacent to sandy flats will be good too. Northern Pike on shoreline related weeds have responded to casting during the past week. Large (1 ounce or more) Rattle Traps, jerkbaits like the Suick or Reef Hawg and Musky size spinnerbaits are all producing some nice fish right now. Live bait rigging or bobber fishing with large minnows will also put some fish in the boat. Deeper, green weeds are preferred for casting or bobber fishing. Rocky shoreline points are key areas for live bait rigging. Most of the better size fish are keying in on larger bait fish like Tulibees, so look for areas that connect to deeper water where the Tulibees will stage just before they move in for the fall spawning runs. As the water continues to cool, Tulibee will move toward shorelines areas where rock and gravel provide good spawning cover. Larger Pike and Musky will lurk in these areas until after freeze up. Fall fishing for large Walleye has become a favorite of mine and some of my customers. As the season progresses, we'll focus our attention on deep points with rock or gravel. When it comes to minnows, super size Redtails, Creek Chubs or Rainbow Chubs will put fish in the boat. 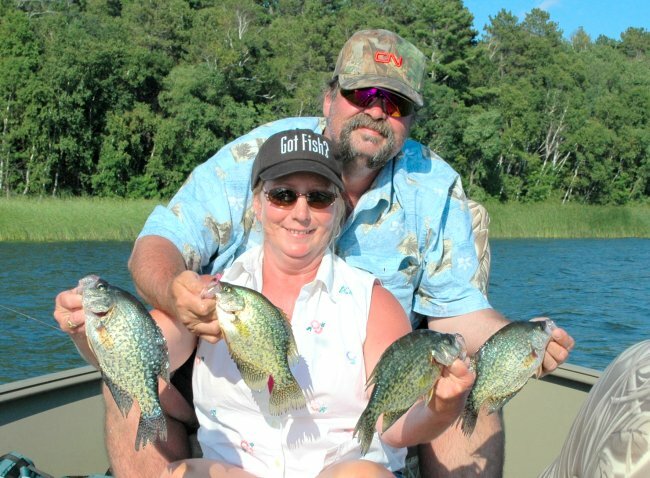 Crappie action has been reliable for the past several weeks. Crappies on some of the more well known spots have moved into deep water of 30 feet or more. Fishing Report! 9-29-08 Jeff Sundin - Fall Fishing Patterns Peaking! Another week of surface temperatures in the low 60° range. These are nearly ideal water temperatures and should continue to trigger peak fall fishing for the next couple of weeks. If the current long term weather forecast of warm daytime temperatures and sunny skies continue next week, it could be about as close to paradise as you can get! I usually count on really good fishing until the surface temperatures fall below 55°F so the longer we have temps hovering in the high 50's, the better. Fishing activity really has been steady, even fantastic on certain days. 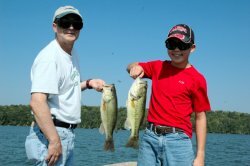 There are already a few "hot bites" going and most of the better fall lakes are producing good mixed bag fishing. Walleyes continue to show up in larger numbers on the weedlines and the adjacent breaklines. Breezy or cloudy conditions encourage the fish to feed more heavily and at these times, they've been moving into shallow water of 5 to 8 feet. Calm, sunny conditions force the fish a bit deeper, but they don't move far. If your shallow fishing pattern slows down, move out to the next deeper breakline adjacent to the area you were previously fishing and 8 out of 10 times the fish will be right there. Even though there are plenty of fish to catch on the shallow weedlines, this is the time of year that we really enjoy looking for some of the larger fish that feed heavily before the turnover arrives. Deeper points, rock spines and "premium weeds" are great locations for larger fish. Whether you stick with the jig and minnow or prefer live bait rigging, start going with larger minnows to improve your chances. Red Tails, Creek Chubs or Extra Large Rainbow Chubs will trigger these larger fish. I prefer minnows in the 6 to 8 inch range and generally use a live bait rig, 5 to 6 foot leader tied with 18 pound test fluorocarbon to protect from bite offs when we encounter larger Pike. Crappies continue to provide good action, but some of the more popular lakes (and spots) have been getting heavy pressure. A really great game plan now would be to start checking some of the off-beat lakes that you haven't heard a lot of chatter about. Many of the fish have begun moving away from the shoreline related breaks and weed edges and are now out in open water. They're not necessarily relating to structure, so they're prone to moving around a bit. Keep prowling around in water depths of 22 to 35 feet until you find a school. They can be a little tricky to stay on top of, but you can stay with them and they are in a biting mood. On a couple of the shallower Crappie lakes in the Deer River area, we've found that some fish are not schooled in packs, but are spread out horizontally near the bottom. A better approach on these shallower lakes (20 feet or less) is to troll or drift slowly with a 1/16 to 1/8 ounce jig head tipped with a 2 or 3 inch action tail. I've had good luck with Berkley's power grubs by swimming the bait a couple of feet above the bottom. 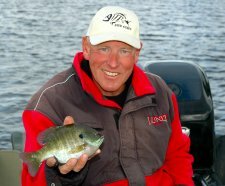 Perch fishing has been spotty, but there are a few good spots and some quality fish available. There have been days when I've searched hard to find them, but the reward has been above average size when we find them. You'll need to do some experimenting because there are some fish on deep rocks, some are shallow on the weedlines and others are roaming mid-depth flats. 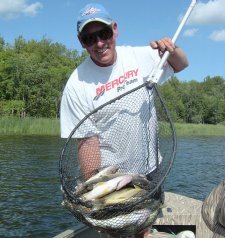 For me, it's locating perch has been simpler if I just fish for Walleyes and wait until I stumble in to a small school of Perch. If it looks like there's some potential, I'll stop and spend some time fishing Perch. A slow, vertical jigging approach has been best. A 1/8 or 1/4 ounce jig tipped with a fathead or medium size rainbow has worked fine. Don't shy away from fishing in the weeds, many of the fish we've caught have been located right in the jungle. Bluegill action is holding steady but the fish are starting to shift away from the weedlines and show up out in a little deeper water. We're not finding the gills as deep as the Crappies, but the 15 to 20 foot range is starting to look pretty good. If you like fishing weeds better, you'll still find schools of fish on the weed edges too, so check some of these spots as well. We're sticking with the 1/16 ounce jig and chunk or night crawler and it continues to work great. Northern Pike of small to medium size are much easier to capture right now and we've started seeing some better fish as well. Pike in the 28 to 30 inch range are moving on the better days. Breezy, cloudy or light rain will really pick up the action and this is when we've seen most of the better size fish. We're catching most all of the pike on the crankbaits as we troll the weedlines, but I've been watching other anglers casting spinnerbaits, jerkbaits and bucktails as well. Reports from the casters are nixed, but as these weedlines continue to get more active, Pike will continue to show up in better numbers. Largemouth Bass fishing was fairly good last week and the location was what you'd expect for the late summer. Weedlines located in 8 to 12 feet of water with rock or gravel was the best for me, but, there were a smattering of fish located on the shorelines too. Shoreline spots were better if there were some deeper rock or wood adjacent to steeper drop off areas. We fished some of the shallow bulrush, wild rice patterns that would typically be good at this time of year and found that the fish with either not there or inactive. Due to higher water this year, I think some of these fish are just so far back in the slop that we can't reach them. Stick with the deep weed edges and at least you'll have some action. 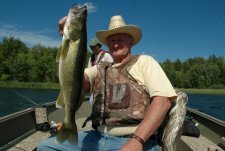 Deep water fishing for large Walleye has become a favorite of mine and some of my customers. As the season progresses, we'll focus our attention on deep points with rock or gravel. When it comes to minnows, super size Redtails, Creek Chubs or Rainbow Chubs will put fish in the boat. Perch quality has improved, but the action remains spotty. Your best bet is to fish for Walleye until you stumble in to a better school of Perch. Fishing Report! 9-9-08 Jeff Sundin - Fall Fishing, Blowin' in the Wind! The fall fishing season looks like it's here to stay as the surface water temperatures continue to trend downward. As of Sunday (9-8) were seeing temperatures averaging around 66 degrees and with the cooler than normal week predicted by the weather service, it looks like this will be enough to keep the fish moving in our direction. The initial impact of these cooler temperatures has been a noticeable increase in both Walleye and Northern Pike activity, especially in the shallow water, weedlines and wind blown rocky areas. There are lots of baitfish showing up on the flats adjacent to weedlines and this should continue to trigger good shallow water action. 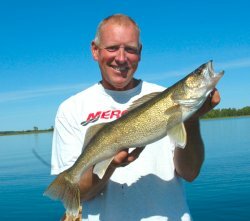 Walleyes have begun to show up in larger numbers on the weedlines, but really good action still depends on the wind. To the extent that you can locate scattered schools of fish in areas where the wind is kicking a nice chop up on the water, drifting these shoreline areas will produce fish reliably using a jig and minnow. When the wind won't blow, these fish are split into smaller groups. Some of them are tucking into heavier weed cover and some moving out a few feet deeper on to the flats adjacent to the weedlines. During the calm times, we're still doing better on the weed fish by scrounging right up in the weeds with night crawlers. For the fish that move out a bit deeper onto the flats, we've had some success trolling crankbaits, but the Northern Pike have outnumbered Walleyes by 3 to 1. on the shallower weed edges in 6 to 8 feet of water, we've had great action on the #4 Salmo Hornets trolled about 60 feet behind the boat at 2.3 to 2.5 MPH. When the fish move out into the 10 to 12 foot range, we need baits that dig a little deeper and for me the #7 Shad Raps are just about right. Crappies continue to gain momentum as they move into deeper open water haunts. Some of the deeper Cabbage or Coontail weeds still have fish in them, but steep pockets or holes close to the shoreline and any type of submerged wood you might be able to locate are holding the lions share of these fish now. Some of the schools of Crappie have even shown up out in more open water, further away from the shoreline in the 22 to 25 foot depth range. These deeper fish are fairly easy to locate if you keep an eagle eye on your electronics. Once a school is located, stop moving and hover over the fish with your electric trolling motor. Fishing with a jig and minnow in a s-l-o-w, vertical lift/drop motion will almost always do the trick. 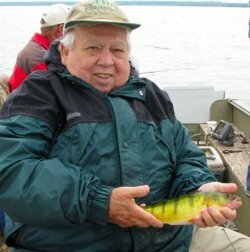 There are times when you'll see the Crappies spread out horizontally in shallower water, say 12 to 15 feet. For these fish it's better to troll or drift slowly using a 1/16 or 1/8 ounce jig head tipped with an action tail like the Berkley Gulps twirl tails or a beetle spin type spinner. You can tip these with minnows if you want to, but I think you'll catch plenty of fish using only the tails. 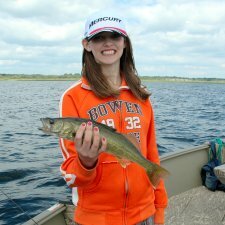 Perch fishing continues to improve but we've continued to see lots and lots of small Perch out there. 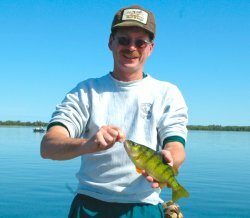 If you're getting hammered by small perch, leave the area because these giant schools of small ones are so aggressive, you'll never get your bait through them in order to discover larger fish. Some of the better size fish are using same weedline areas that hold Walleye. 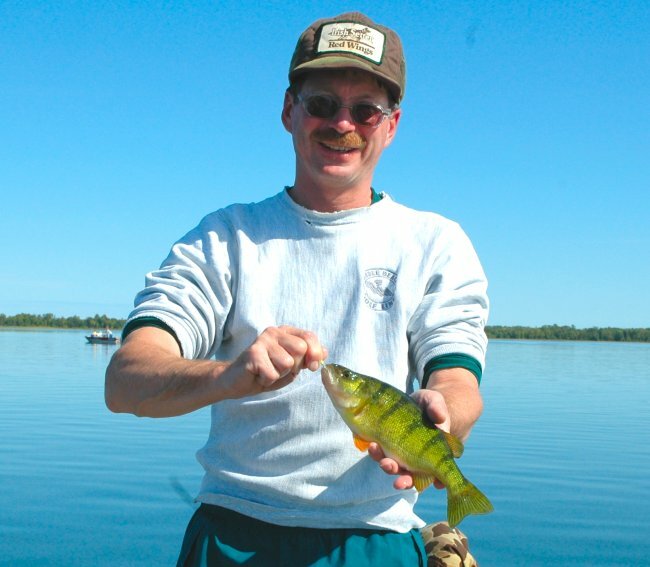 The main lake bars still have good schools of Perch as do the deep rocks located out on main lake flats. Jigs tipped with larger than average minnows will help you select for a better average size. Spinners tipped with minnows trolled along weed edges or on gravel generally helps get faster action. Musky fishing has perked up this week too although I haven't been able to fish them. I've heard several reports from folks who have caught or seen multiple fish during the past ten days. I know of one angler who caught two Muskies on the South end of Lake Winnie this past Friday. Cass Lake, Moose Lake and Deer Lake have all been improving as well. Deep water panfish action is just so much fun we can't quit. Sunfish and Crappies have been keeping us busy on small lakes for well over a month now and with cooler temperatures, action will continue to improve. Here's a good look at what your graph should look like when you find a school of panfish on these deeper breaklines. These are Crappies, notice the heavier, yellow appearance of some of the larger fish. That's a good signal that you've found an "above average" school of fish. Here's the payoff, a nice Crappie caught on a 1/16 ounce jig tipped with a 1/2 inch long piece of night crawler. Fishing Report! 8-28-08 Jeff Sundin -"Temperatures Cool Down, Action Heats Up! Our first taste of fall weather came this week with a night time dip into the 40 low degree range in Deer River and surrounding area. during the past five days we've had everything from calm, sunny days to strong gusty winds and even a couple of thunderstorms to boot. The surface water temperatures that were up in the mid to high seventies last week, have dipped into the high sixties as of Wednesday (8/27). The storms that blew through early on Wednesday morning did slow down the bite, but even with that, we had a fairly good mixed bag of Crappie, Bluegills and Pike. Walleye fishing that had been fairly strong for the past few days, did slow down, but we still saw folks picking up some eating size fish on Wednesday. Bluegill action is holding steady with fish continuing to hold tight to the weed edges. This week we continued to catch fish using the slow troll or drift method. We just move slowly along deeper weedy areas until we hit a fish or two and if the area looks good, we toss out a marker and sit still over the school for a while. Presentation for me has been unchanged, I like a 1/16 ounce jig head, darker colors and a piece of cut night crawler. A group of anglers that we fished with this week spent some time looking for 'gills in the shallow bulrushes and found a lot of action there too. So even it's worth taking a look at some of the "spring" type of cover too. Fish these shallower areas with a bobber set just above the bottom (typically two or three feet) and a small jig tipped with a piece of worm. Walleye fishing started to show signs of new strength this week as the turbulent weather cooled down the water and "turned on" some schools of fish. I spent several days this week fishing with a large business group on Lake Winnie and had a chance to compare notes with a lot of great fishing guides. The walleye patterns (on Winnie) were varied and it seemed like almost everyone used their own twist for catching fish this week. What looked like the best patterns for the week were; 1) tolling crankbaits in shallow water. Best performers were the Salmo #4 Hornets. The hot colors varied but the Perch, Viking and Blues were all good at one time or another. 2) Shallow weedline fishing with jig and minnow or live bait rigs with night crawlers. Lots of the shallow (5 to 7 feet of water) Walleyes got moving during those really windy days and almost everyone fishing in the shallows found some fish. The only real secret was that you had to stay in the weeds. There were fish on both the inside and outside edges of the weedlines, but if you roam too far out into open water, you'll lose contact with the fish. 3) The deeper main lake bars staged a rally this week too and folks fishing with live bait rigs in the 16 to 24 foot range had some great walleye fishing out there too. 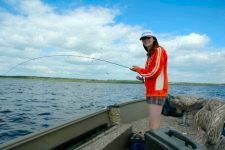 This is a fairly typical late summer pattern and there were fish on virtually all of the main lake bars, so if you like to fish deep, now would be a good time to take a look at your favorite spots. This early "pre-fall" spurt of action is really common at this time of year and the usual down side is that you have to have some fairly good breeze to keep the shallow fish active. If you happen to be on the lake on a calm day, this deep pattern might be a good way to salvage your trip. Crappies are gaining a little momentum this week too and some of the fish that spent all summer in the weeds are showing up out on those deeper weedline edges. I still wouldn't call it an all out hot bite, but we have been able to consistently gather some mid size fish and even get our hands on a few nicer size fish too. The early fall/ late summer fishing spots are still the best. Deeper Cabbage or Coontail, Steep pockets or holes close to the shoreline and any type of submerged wood you might be able to locate. 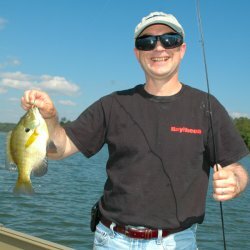 Branches, sunken logs or Crappie cribs are holding some fish. Northern Pike of medium size are getting easier to capture right now. We're still not seeing many fish over the 26 to 28 inch mark, but there are a lot of these 3 to 4 pounders out there. During the past week, we've had the better luck by trolling the larger rattle traps. The fish have shown preferences for certain colors, so keep experimenting with color and sizes. I generally prefer casting rather than trolling for Pike and there have been times that I've been able to get a few fish going on the larger M & G Musky Spinnerbaits, but we've had a lot of short strikes on these. I guess the trolling is the best strategy at least for now. Deep water Bass action is keeping us busy on small lakes. The father & son team of David and Chris Allan caught this nice pair on plastic worms fished on a mixed weed/rocky point. Another good one, In Northern Minnesota we don't catch too many magnum size bass, but for average size, it's tough to do much better. 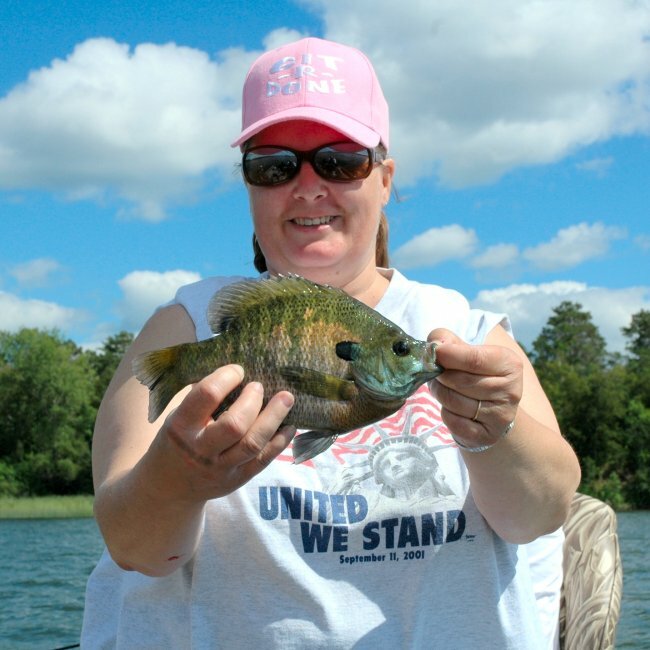 Bluegill action continues to keep us busy. We've had some slower times, but overall the Bluegills have been cooperative and the quality has been good. No Musky fishing for me this week, but some gossip from friends is that the Cass Lake fish are perking up a bit. I'm still hoping that with the water warming continually, we should see an increase in the action coming up soon. Maybe this will be the year of a great fall bite, who knows? Fishing Report! 8-20-08 Jeff Sundin - "Stay Cool" to heat up the Walleye Action! Yet another warm, sunny week in Northern Minnesota. Surface temperatures on a few of the Deer River area lakes are pushing up into the 76 to 78 degree range and I've seen it take a toll on the some of the popular Walleye fishing spots. I've fallen in to a couple of traps myself this week when I've gone to couple of lakes that had been producing well for me during the past month. With the warm surface temperatures and bright conditions, the Walleyes have started to show signs of a bad case of lock-jaw. Panfish and Bass don't mind the warmer water temperatures and for them, the action is picking up. Even though the Surface water temperatures have been rising, there aren't any cases of summer fish kills that I know of so far. With fall temperatures due to arrive in just a few weeks, we may discover that the Oxygen depletion that usually forces larger Pike and Musky into the shallows, might night occur this season. With a cold front predicted for the weekend, I won't be surprised if the roller coaster ride gets even more unpredictable. Bluegills continue to be my strong suit. We've had consistent action on several area lakes and with few exceptions the average size has been good. As the action continues to pick up, we continually find schools of fish in new locations, so searching for them has gotten a lot easier. 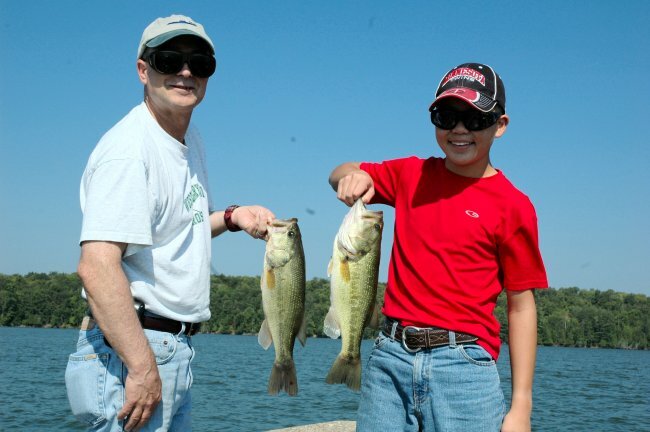 Depending on the type of lake you're fishing, you may choose to fish for bass or Walleye along the weed edges and stop to catch some 'gills when you stumble across them. This has happened to me several times this week. Fishing a plastic worm along the deeper weed edges for Bass and you'll locate Bluegills as they nip at the tail of the soft plastics. the same concept is true when you're fishing weedlines for Walleyes and the Sunfish nip at your live bait rigs. Either way, it gets you into a nice "mixed bag" situation. Presentation for me has been unchanged, I like a 1/16 ounce jig head, darker colors and a piece of cut night crawler. This week I had some folks who also did really well using a #4 plain hook and a split shot sinker. 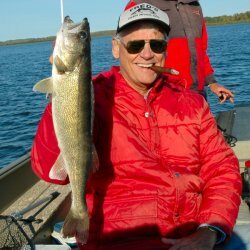 Like I said, the Walleye fishing has had it's up and downs for me this past week and it looks like my strategy for the up-coming week will be to seek out lakes with cooler temperatures. I can't really explain why this happens, but during the summer, the closer surface temperatures get to 80 degrees, the slower the Walleye action on that lake becomes. Lakes that typically have good Walleye action in late August are the deeper, cooler ones like Cass Lake, Western Leech Lake, Deer Lake and others like this. Weedlines will still be key locations, but some of these lakes also have deep water structures that hold good schools of fish as well. For me, night crawlers are still the best bait, but I've had a little luck on jig and minnow combinations too. Trolling with crankbaits has also been somewhat productive, but it's been un-predictable. One day (or part of a day) it works, the next day it doesn't. Give them a try when the conditions look right and experiment with other offerings as the urge strikes. Even though I use the term "deeper lakes", I don't necessarily mean deeper fish. 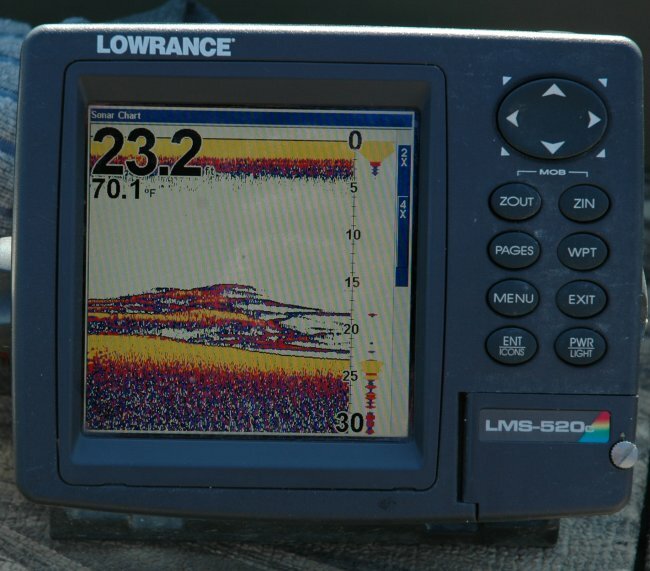 Walleye location has still been most predictable on the weedlines in 12 to 18 feet of water. We had a couple of really nice experiences with Crappies this week as the early signs of a fall movement begin to show. It's a little early for a full scale "Crappie Bite", but we have been able to roam the steeper drop off edges and find some small schools of fish gathering. 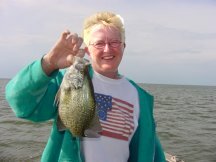 16 to 20 feet of water has been best, 1/8 ounce or 1/16 ounce jig head tipped with a Crappie Minnow and fish vertically. Simple, slow lift and drop presentation works the best. I lost track of the Largemouth Bass last week because we never fished them, but I did take note of a bunch of Bass that were caught and dressed out at the cleaning shack on Leech Lake. I presume this means that the Wild Rice and Bulrushes over there are producing some nice Bass right now. I have a Bass trip today and plan on fishing the deeper weed edges in 8 to 12 feet of water. If things are as I expect, we should locate some fish on these weedlines and I may post an update tomorrow. Northern Pike of small to medium size are plentiful on the deeper weedlines and easy to catch on on jig and minnow or by trolling crankbaits. I haven't seen any evidence of really nice Pike moving into shallow water and the only fish that we've caught that were above average, were located on some rocks up on Red lake. We managed a 36 inch and a couple of 32 inchers up there, but no giants. The fish we caught (on Red) were by trolling the large M&G Musky Spinnerbaits. We've caught quite a few of the "eater" size Pike on the neighborhood lakes with a 1/8 ounce jig head and a 4 inch Berkley Power Grub. I've been rigging a 12 inch leader made from 17 pound fluorocarbon line and this has been enough protection against most bite-offs. Perch fishing continues to improve. In fact when you get into a school of small ones, you may think it's improving too much! There are some schools of good size fish though and these are starting to show up on the shallower weedlines. Whenever you can locate weeds mixed with light rock or gravel, you will find some Perch. There are still some good schools of Perch in deeper water too, but we've been sticking with the shallower water to take better advantage of the mixed bag opportunities. Simple jig and minnow fishing will get you into some action. Walleye like this aren't always expected at this time of the summer, but they do come along. Marion Roberts fooled this one with a night crawler on the heavy weedline. A nice day's work! I've had some ups and downs in the Walleye category this week, but it looks like we had a good day in the weeds. 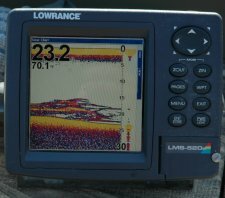 For Walleye, I'm looking for lakes with cooler temperatures until the cooler fall temperatures begin to arrive. Early signs of the fall Crappie bite are starting to show. We've had a couple of good opportunities already and as the schools of fish build in number, the action will continue to improve. When you hit a nice school of Crappie, the action is fast and furious! Mike & Marsha topped off their honeymoon fishing trip with a quick limit! This has been another typical mid August week with mostly sunny skies, calm seas and stable water temperatures. There have been a few ups and downs in the walleye fishing, but the panfish and Bass have taken up the slack and anglers open to the opportunities, have had some good action. Surface water temperatures have been stable in the 73 to 74 degree range. We've seen a lot of new Algae bloom add color to the water this week, but still no evidence of any fish kill from Oxygen depletion. Cooler water and higher water levels probably explain the shortage of Larger Pike and Muskies in a lot of their typical late summer haunts. But with the Bluegill and Bass action picking up, we're probably just around the corner from a pick up in the pike and Musky action too. Walleye fishing continues to be "above average" for this period of the summer. But I've started having some trouble using night crawlers. Up to this point, it's been my favorite presentation, but with all of the panfish and small Perch on a rampage now, it's awful hard to steer a night crawler through all of the small fish and into the Walleye lair. To avoid this problem, there have been a lot of folks sticking with the jig and minnow combinations, but for me, the best bet has been to put up with the Perch and Bluegills until we find small schools of Walleye. When we do find active Walleyes, the Perch bite usually tapers off enough that we can concentrate. Leeches are also productive on certain days, or on certain spots, but the small fish are hammering these as well and I've chosen to conserve on my Leech supply and let the panfish eat up all of my worms instead. On a search for Bluegills this past week, we discovered good schools of active Largemouth Bass using the deeper weed edges in 8 to 12 feet of water. It's been sunny, so these fish have been in fairly heavy cover and rooting them out was easiest with plastic worms. Fishing right in the heavy cover, put the most fish in the boat, but on overcast days, I'd guess that the fish would roam out away from the heavy cover a bit more and then you'd be able to fish a wider variety of baits. We also had a lot of action using Berkley's Power Bait Crawfish on a plain jig head. Northern Pike really like these as much or more than the Bass do. So if you want a good combo Bass and Pike gimmick, these things will really do the trick. We just toss the jig and crawdad into the deeper weed edges and make sure it has time to hit the bottom. Sharper jigging action with a pause between jigging will trigger plenty of fish. I don't bother using a steel leader, but sometimes a short length of 17 pound mono will help save your baits from getting snipped off by Pike. No Musky fishing for me this week, so I'll have to gather some gossip from friends. With the water warming continually, we should see an increase in the action coming up soon, but so far this hasn't been a banner year for Muskies. Bluegill fishing has been at the top of my list this week. There have been several lakes producing above average action, average size has been good. We've been finding the Bluegills in 8 to 11 feet of water and relating close to the weeds. Start by cruising the weedline looking for schools of fish on your graph, test the action and move when necessary. Click to zoom in on the image of a school of Bluegills hovering above a deeper grass line. These fish were active, but we had to keep our baits high enough in the water to capture their attention. Another nice week! Stable, warm weather has notched up the surface temperatures into the 74 to 76 degree range and we can feel the action shifting toward Bass and Panfish a little more each day. With a lot of sunshine and fairly calm conditions, the lakes are starting to show some heavier Algae bloom right now and it's helping make the "shallow bite" a little easier. We're still having some reasonable success with the Walleyes, but the Bluegill and Bass are getting more fun every day. Bluegills that had been a little illusive during the daytime, have really picked up the pace. This week I finally feel like I'm on equal terms with the folks who have been getting great Bluegill action during the evening twilight. We've discovered several schools of above average bluegill during our search for Walleyes. When I've stopped and taken some time to fish them, we've had consistent action by hovering with the trolling motor and vertical jigging with a simple 1/16 ounce jig tipped with cut night crawler pieces or small leeches. I think we've caught fish on about every color of jig I own, but these fish seem to favor the darker combinations like Black/Green, Brown/Orange and solid Black. 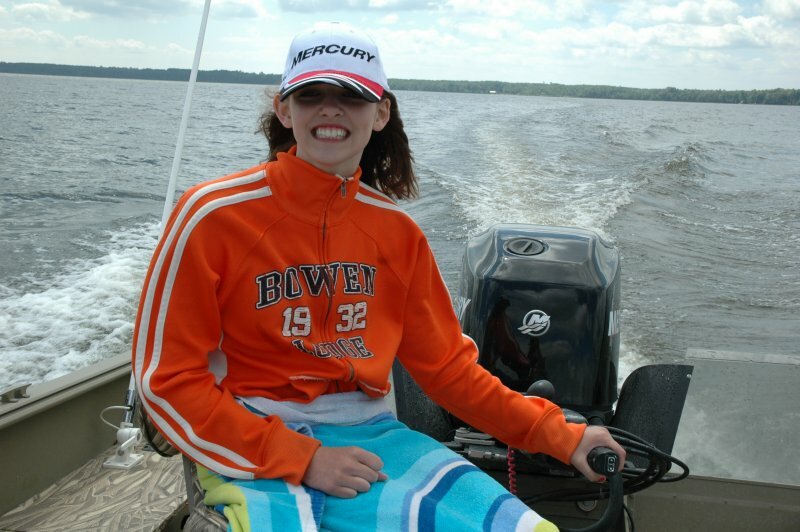 Future Mercury Pro Team member Katie Sundin took a couple of hours off to show dad how to find 'em. Hey dad, What's the big deal. Ya just drop your worm in the water and set the hook. Walleye schools continue to build up on the weedlines. This nice "eater' came out of about 12 feet of water at the edge of the weeds.